Last weekend was Santiago’s “Welcome to America” Party. 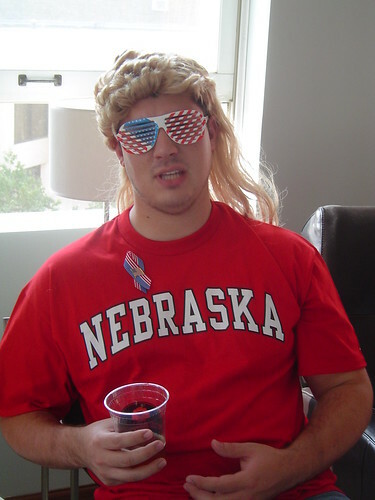 In honor of him becoming a US citizen we had a pony keg of Empyrean LunsSea ESB, (Local Lincoln Brew), hamburgers and hot dogs, and of course a mullet wig. Santi received a few gifts that could only be found in America, but not necessarily made in America. Fun was had by all, too much fun in my case, and no one got arrested, though it looked like would should have been. This entry was posted on October 7, 2008 at 1:14 am and is filed under Events. You can follow any responses to this entry through the RSS 2.0 feed. You can leave a response, or trackback from your own site.